The cardinal principle of California water law is that all water rights, and all uses of water, must be reasonable. This seemingly simple and innocuous sentence masks a world of meaning and complexity, however, because the requirement of reasonable use embraces at least four interrelated concepts. 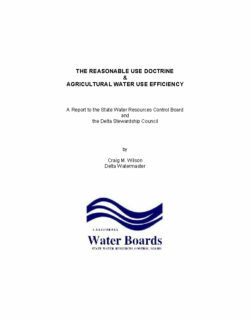 The determination of reasonable water use is utilitarian: the law seeks to encourage relatively efficient, economically and socially beneficial uses of the state’s water resources. It is situational: the evaluation of individual reasonable use concerns not only the water right holder’s own uses but also other competing demands (both consumptive and ecological) on the water resource. 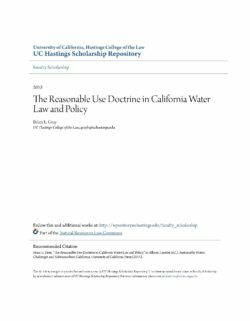 The reasonable use doctrine is also dynamic: the definition of reasonable use varies as the economy, technology, demographics, hydrologic conditions, environment, and societal needs evolve. 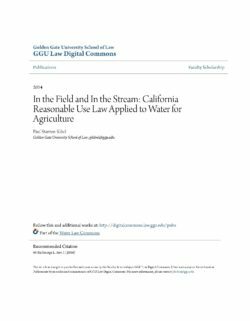 And, because all uses of water must be consistent with this interdependent and variable definition of reasonable use, the law renders all water rights fragile. A water right that was reasonable when first recognized, and which may have been exercised reasonably for many years, may become unreasonable as hydrologic conditions change, as California’s economy evolves, as population grows and new demands for water arise, as ecological needs are better understood, and as the environmental laws that protect the state’s aquatic ecosystems and native species are applied in ways that limit the impoundment and diversion of water for consumptive uses. 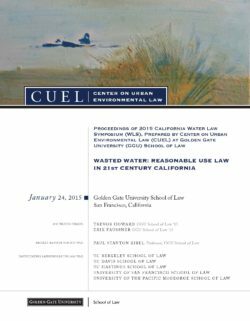 The 2015 California Water Law Symposium focused on the reasonable use of water in modern day California.